At the Albright-Knox Art Gallery, the rotating array of impressive exhibitions like “We the People”, which includes some of the gallery’s most recent acquisitions, and the upcoming “Humble and Human”, a collaborative display of works in partnership with the Detroit Institute of Arts honoring former Buffalo Bills owner Ralph C. Wilson Jr., show how in tune the gallery is with the ever-changing and evolving art world. 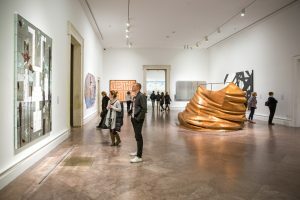 But what really sets the Albright-Knox apart is the enormously well-curated collection of modern and contemporary works from master artists – including Picasso, Matisse, Monet, Modigliani, Chagall, Gris, Braque, Kahlo, Dali and more. It’s a breathtaking exploration into the artistic geniuses that would radically redefine visual art and forever alter how we see the world. 1. It’s right here. In Buffalo. You don’t have to travel to Paris or London or New York to see it. But if you did, you’d be blown away by the quality of the art, the insightful interpretation and the space it’s displayed in. This is an art experience of the highest caliber that would be right at home at MOMA, the Tate Modern or the Centre Pompidou. 2. It’s affordable. Admission to the Albright-Knox is $12. As a point of comparison, the Art Gallery of Ontario charges $25. C’mon down, Canadians! 3. It’s accessible. The lines and crowds that would accompany an exhibit of this quality in New York or Chicago would make actually seeing the art somewhat problematic. As with most things in Buffalo, it’s less crowded and easier here. 4. It’s brilliant. Buffalo is incredibly fortunate to have a museum of the caliber of the Albright-Knox. Most of the exhibits come right from the AK’s permanent collection, which is mind blowing given the transcendent quality of what’s on the walls. Other museums – meaning almost every major art institution around the world – would die to have this collection. 5. It’s inspiring. Our brains are hard wired to respond to the pleasing or provocative arrangement of color and line and form – check out this exhibit and you can be sure your synapses will be singing with pleasure and delight. The Albright-Knox is open Tuesday through Sunday, 10am – 5 pm, and 10 am – 10 pm on M&T First Fridays.